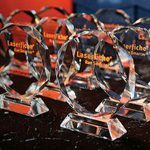 Laserfiche has announced the winners of its annual Run Smarter® Awards program, including two community colleges. College of the Desert uses Laserfiche to automate workflows and give students convenient, 24-hour access to online forms. When students submit forms electronically, the system automatically attaches those materials to a student’s record and emails students with the status of their requests. As a result, this California community college has cut down processing time for applications and petitions by 40%. “What Laserfiche delivered not only exceeded my expectations but fulfilled this vision I had that we could be like a Google or Yahoo! and use the information around us in an efficient way without having to hire staff to do it all,” said Dr. Anabelle Nery, Executive Dean of Enrollment Services at College of the Desert. Tarrant County College District, one of the largest and fastest growing community colleges in Texas, has thousands of students who apply for Veterans Administration (VA) benefits each semester. Using Laserfiche, students can now submit required VA documentation in person, online or by email. This initiative, in addition to the automation of a variety of processes in Student Services and Academic Affairs, has produced an annual savings of nearly $84,000.